Visit Austin and you're likely to see concrete everywhere - in the downtown skyscrapers, paving the ground along 6th Street's music venues, in bridges and interchanges on the outskirts of the city and more. In fact, there's so much concrete that you probably take it for granted. Little did you know that in the last few decades concrete has undergone a transformation. Today, many installers consider themselves artisans and can stamp and color the surface of concrete to look like natural stone, brick, pavers and even wood. Here is a list of stamped concrete contractors in Austin. Applied Concrete Solutions in Cedar Park, TX. One of the best things about stamped concrete is the vast array of color options. In Austin the most popular color choices are browns and other natural earth tones. There are three main ways stamped concrete can be colored: integral coloring in the mix before it is poured, dry-shake color hardeners that are applied to the surface before stamping and stains that are sprayed onto the concrete after stamping. Most contractors use some combination of these three techniques. There is usually a lighter base color and a darker accenting color. Combining techniques helps to achieve variations and depth that provides the authentic look of stone or brick. All Innovative Concrete in Austin, TX. With Austin's warm summers, many homeowners consider a pool a necessity. 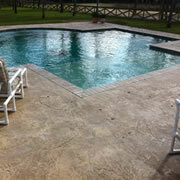 Stamped concrete is a great material for paving around a pool because it is attractive and slip-resistant. The rock-like texture helps bare feet to grip the surface, even when wet and a slip-resistant additive can be applied for even more traction. 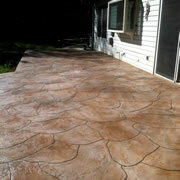 Another thing that's great about stamped concrete is that it blends beautifully with other materials. 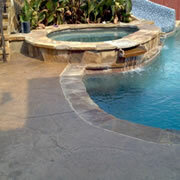 Stamped concrete will look nice next to your pool's coping whether its flagstone, brick or another material. Exquisite Concrete Designs in College Station, TX. There are many pattern options for stamped concrete, but in Austin, people tend to like seamless textures. A seamless texture skin creates a uniform texture that looks like one large slab of stone. This option provides an interesting surface that is clean and crisp and works with nearly any style of architecture. Some homeowners like to have decorative sawcuts made in a diamond pattern to make the concrete look like oversized stone tiles, while others like the simplicity of just the necessary control joints which prevent cracking.